The video includes photos from the weekend the students have shared with us. I hope you have had a wonderful Shabbat – we had such an active day that Shabbat seems as if it happened many days ago. Let’s start with the past two days – actually the four nights so far in Israeli home hospitality. If I was a gold star kind of guy, I would have had to have brought more such stickers than my bag could have held as our students have been outstanding (our definition of that is they have left us alone and when we ask them how they are doing, aside from telling us they are great, they give us that kind of disdainful, eye-rolling, that says, "what a silly question, of course we are great".) The hospitality and generosity of the host families has been unbelievable – we are so grateful to all of them and to the Har Vagai staff who have made our chaperone team feel so special! This morning started as a typical school day – the busses rolled into the parking lot, but this time waiting in the parking lot was a collection of jeeps to take us on an adventure into the Golan. Nine jeeps for our group of 57! After a quick group photo requested by the Mayor’s Office (you see how important we are…in Israel) and some final words from Mr. Dichter, we piled into jeeps and we were off! I know you want to know – it was a gorgeous and perfect day for a jeep ride – warm but not too warm, clear and fresh. The citrus smell of the orange groves as we motored past was a real highlight for me as were the Cranes – birds that migrate from Africa to Europe every Spring. Not to mention the butterflies that were everywhere (apparently we just missed the real butterfly invasion which we hear d could feel like the old Hitchcock film "The Birds"). Up and up we went off-road, bumpity bump. Now I thought I had planned well in choosing the front seat of my jeep with Asher my driver as I saw some boys walking over to the jeep – I guess they saw me too and the next thing I knew six girls were in the back. For those of you who do not know what that means it means singing and shrieking, shrieking and shrieking. To make them feel at ease at having drawn the short straw finding themselves in the same jeep as me, I told them to make as much noise as possible and to have a great time – I assure you that they deserved more gold stars on both accounts! The Golan is unusually green as they have had an extremely wet winter. Mount Hermon actually looked like a mountain that could have been named Grouse (OK, Grouse Jr.) – most impressive was seeing this mountain covered with snow and so clear – often there is a haze in the sky but today visibility was wonderful. 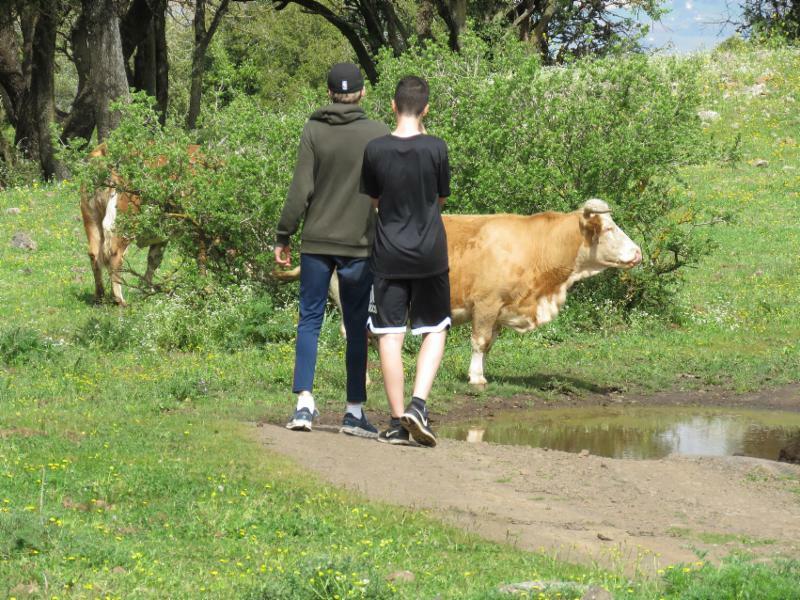 I also think you should know that there were often cows along the road as we drove through the hills – this seemed really important to my jeep-mates, thus I mention it as they did often! Parents, do you take your kids anywhere? After a couple hours of meandering – stopping a couple of times – once to look at villages in Lebanon and to get a geography lesson from a beautiful vantage point, and once to have tea and to step in cow manure (not everyone participated in both or either activity) we made it to Kibbutz El Rom. Here we disembarked for 40 minutes to get snacks and to watch a movie about how the Golan was almost lost in the Yom Kippur War of 1973 and how a fierce tank battle ensued in the Valley of Tears. Commander Avigdor Kahalani and his tank battalion basically held back the Syrians until reinforcement could arrive. We then left the theatre to go to the actual site where the battle took place and to look across the border into Syria – the students are getting a real feel for the neighbourhood! From here it was over to Kibbutz Meron Golan – a gorgeous Kibbutz with tons of famous metal art sculptures – sorry I forget the name of the artist but I love his work – where we had fresh falafel, pita, salad and labaneh – we ate on large mats in the sunshine – I have heard rumour that it can get better than that but I just do not know how (definitely a gold star day). So from our 9 a.m. start it was now back to the school where the jeeps dropped us off around 2 p.m. We let the students roam and wander around for an hour before there was a final debrief meeting between the Israeli host students and our King David students. During this final gathering together we sat in a large circle to reflect on how great the trip has been The students shared new words they learned in Hebrew and English, new cultural findings from our friends, best memories, and well wishes. Head of Grade, Dorit Sheva, told the kids what a pleasure they were to have at Har Vagai and wished us the best for our future. Our students and staff also took the opportunity to thank their hosts for their kindness and generosity. Before we boarded the buses back to host families many students from both countries had tears in their eyes in anticipation of tomorrow’s departure. From this, we can definitely say it was a successful mifgash. 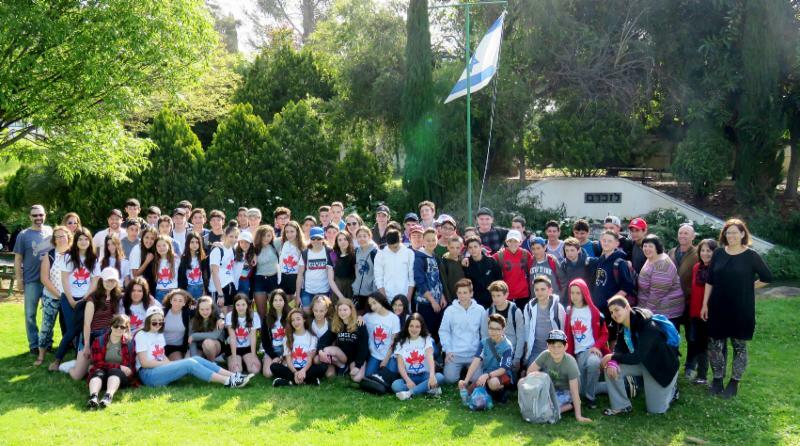 We left the students with one final message, "this year in Kiryat Shmona and next year in Vancouver." Tomorrow is another action packed day – please do not worry if you do not get an update tomorrow as we sometimes cannot get it out as WiFi is very unpredictable at our next location – Kfar Hanokdim (our Bedouin Tent overnight) in the middle of the desert near Masada. Lehitraot – hope to catch up with you tomorrow.